This was just one of a wide range of features that were designed into the boat which carries a 24-foot beam on a length of just under 50 feet. 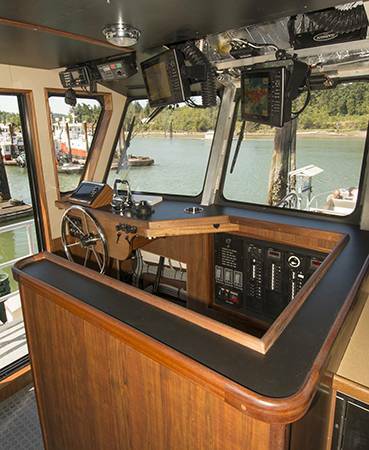 The bow has a raised fo’c’sle with bunks and head. A low waist deck extends aft to a poop deck that raises about three feet to provide a good engine room space. 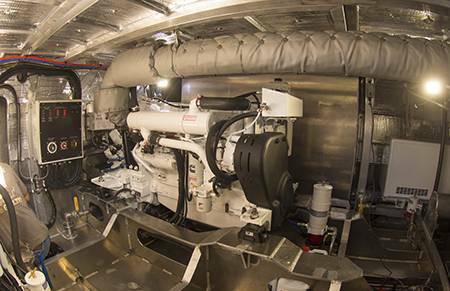 An open area over the poop deck has pillars on either side with a head in one and engine room access in the other. 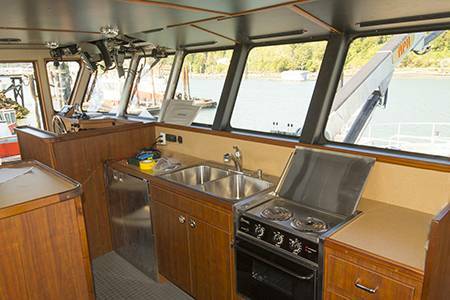 The raised wheelhouse, extending nearly the full width of the boat, includes a basic galley, mess table and two more bunks in addition to the usual GPS, electronic charts, radar and other navigation and system controls. 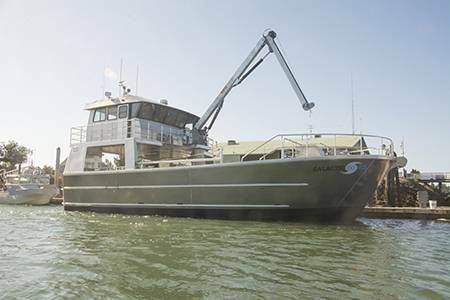 This is a highly practical workboat. 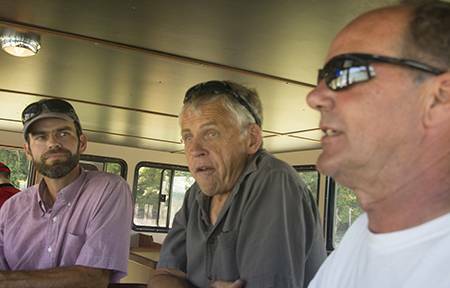 Carpenter, President, and Dave Hansen, General Manager of Lummi Island Cooperative along-with Lummi Wild’s reef net manager Ian Kirouac worked with Zachery Battle, one of the principals of La Conner, Washington’s Mavrik Marine, to draw up the design. This was then passed to Jensen Maritime who did the final engineering and hydrostatics upon which Mavri’s in-house staff finished the final modeling and construction details. Mavrik Marine is a relatively new aluminum yard with a strong reputation for innovation and quality. Both of these are well represented in the Galactic Ice. 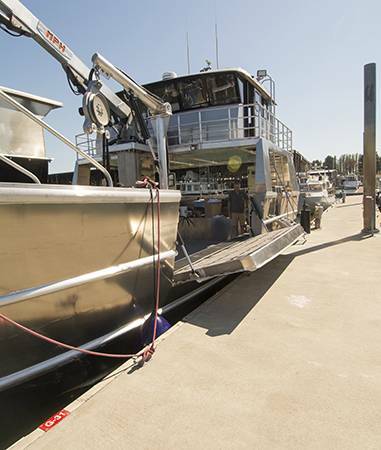 “This is the first purpose built tender for the reef net fishery,” said Carpenter. Even the casual observer will note the quality of Mavrik fabrication. 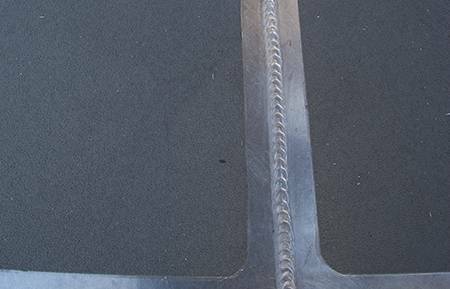 None of the welds have been ground, so that each and every one of them proudly proclaims the proficiency of the welders by looking like “a stack of new dimes”. One of the final touches was a worker carefully going around each of the decks’ non-skid pads with a tube of waterproof sealant. “It a good thing that I paint at home so I have a steady hand,” he proclaimed proudly. 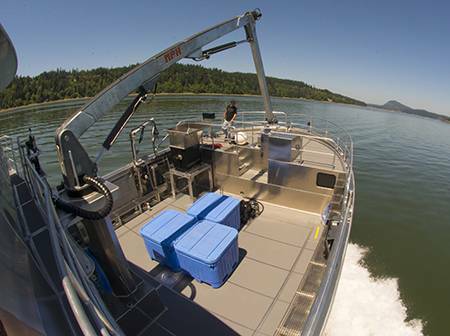 With capacity for two layers of 37 insulated totes in the waist deck, the boat can pack a total of 130,000 pounds. Skiffs will transfer the fish from the reef net platforms, where they have been live-bled for quality, to the tender. On the port side the whole bulwark lowers hydraulically to allow skiff to off load from their level. On the starboard side an aluminum boom can be extended out for mooring of skiffs waiting to off load. 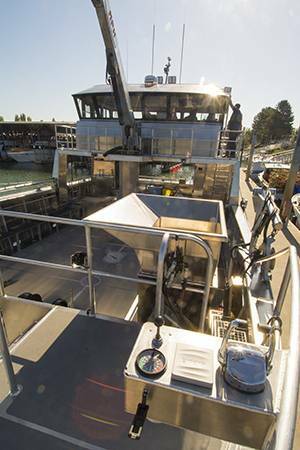 A crane, mounted mid-ship at the front of the wheelhouse can lift up to 2,000 pounds at 30-feet, so it will easily be able to handle the totes of iced fish which weigh between 15 and 1,800 pounds. Quality is given priority for the catches of Fraser River sockeye. When ice is kept in totes for any length of time it fuses into solid chunks that can, in turn, bruise the fish. To prevent this, there is a “refresher” mounted on deck to re-work the ice back to small particles.